» Please check out our collection of "Hope" cards (in Featured Products) to send to family or friends who are in need of encouragement. 100% of commissions earned on the sale of these cards go directly to cancer research. The first "Hope" card (gray) was designed by Robin in 2008 in honor (and now in memory) of her good friend, John, who battled a brain tumor, and also in memory of her father. By the end of 2017, we had sold 3,030 Hope cards with 100% of the commissions going to the Southeastern Brain Tumor Foundation. 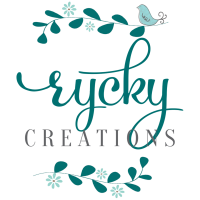 About Me: Rycky Creations began in 2008 as a collaboration of two friends, Robin & Kim. At the time, Kim had been trying to talk Robin into using her God-given artistic talent publicly, rather than just for personal pleasure and use. Since Robin enjoyed painting and photography, and Kim was an inspiring writer, they decided to combine their talents and Rycky Creations was born. ------------ IN MEMORY: In 2015, Rycky Creations’ business partner, Kim, passed away after a long cancer battle. She is missed every day! Hello and thanks for stopping by our store. If you see an image you like, but want a different sentiment on the front, feel free to contact us at ryckycreations@bellsouth.net and we will do our best to create a card for you. Or, you can personalize any card by changing the inside verse to suit your needs. Just click on "Personalize Card" and type in whatever you want to say inside. For more cards and gifts, check out our website: SimplyRobinCreations.com Thank you for visiting our store! I really enjoy your card shop--wonderful photos and nice design work. ! Love the red Merry Christmas Snowman Cards with the red birds. Will enjoy sending them out....so pretty ! Beautiful card store you have here! I really like your cards! You are very talented! You have many hidden treasures here! Very, very nice designs and style with lovely sentiments. Much success to you both! Hi Robin & thanks so much for the kind words on my photos. You have a wonderful talent & are putting it to great use here on GCU. I wish you MANY sales. Hi Robin- Thanks for visiting my shop and for your very nice reviews! You have a wonderful talent and I enjoyed looking through all your lovely creations! Blessings to you (and Kim)! Wonderful store.........love the artwork as well as the photography! Absolutely lovely, ladies! Makes me want to dig out my paintbrushes. Your sense of perspective and color coordination is very pleasing. Verse simple and poignant. Welcome to GCU. I have a list of fellow artists here, whose shops I enjoy visiting. Yours will be on that list. Hi Robin and Kim, You've got some real beautiful cards here with beautiful wordings..
Beautiful selection of cards. Lovelyl images as well as great inside verses. Love your Saint Patrick's Day Finding a great friend card. Absolutely beautiful! I just received my second order of cards and was very pleased. I especially enjoyed the "Loyalty" card that I ordered for a friend. Thank You! The three cards that I ordered came this week and were beautiful. I plan to order more!